CopyRite XP 2.0 by DaveSoft is a powerful tool which sits on top of Microsoft RoboCopy. CopyRite XP 2.0 by DaveSoft© is a powerful new tool which sits on top of Microsoft RoboCopy. 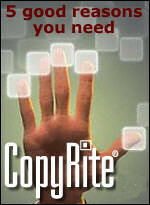 CopyRite adds sophistication to file copy, backup or synchronization. CopyRite is a feature-rich system that David Kendrick has designed to perform all Microsoft© RoboCopy functions. The key feature is an easy-to-use interface instead of that tricky command-line syntax. Robust copy with ‘Point and Click’ interface. No more typing scary ‘DOS’ syntax. Mouse over Tool Tips explain the more cryptic options. Remembers last run job for easy repeating of job. Save and load any number of jobs. Remembers frequently used source and destination paths and stores them in a drop-down list. Accurate progress indicator displays current progress and current file. Create Source and Destination folders on the fly while browsing. Specify exactly what types of files and folders get copied. Include or exclude files based on Attributes. Failed jobs can be restarted from where they left off. Even in the middle of a large file. CopyRite XP works with Windows Vista OS! If interrupted, RoboCopy can carry on where it left off. A mirror mode which enables RoboCopy to ‘Mirror’ directory trees. Can deal with NTFS ACLS (Access control lists). The include and exclude switches are handy for filter the files that you copy.